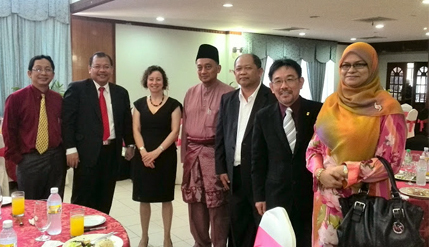 BANGI, 25 April 2014 – Flinders University of Adelaide, Australia is offering doctoral scholarships for science and engineering students of The National University of Malaysia (UKM) that can be done in both universities jointly supervised by a thesis supervisor at each institution. Flinders University Pro Vice-Chancellor (International) Professor Nancy Cromar said the selected UKM doctoral students can attend the two universities alternately with the candidates needing to take only one comprehensive examination. Prof Cromar was speaking to the UKM News Portal after discussing the proposal with UKM Director of the Centre of International Relations, Prof Dr Imran Ho here today about the offer known as a Cotutelle Doctoral Programme. Prof Cromar said the Cotutelle scholarship includes Flinders contributing a maximum of A$10,000 to each UKM student with equivalent funding being matched by UKM. Thus a total living allowance scholarship of A$20,000 is available per student, which works out to UKM paying RM30,200 for each candidate. The requirement is that each UKM student must spend a minimum of 12 months at Flinders University as part of the PhD programme. Once the student completes his doctoral programme each university confers a separate degree, with a mention of the Cotutelle collaboration on the degrees. Prof Cromar is confident of close relationships between the two universities saying that despite some early challenges, the relationship has progressed well with the first group of five UKM undergraduate students studying at Flinders sponsored by the Malaysian government. The students spent 2013 studying at the Faculty of Science and Engineering with the majority taking up programmes in the School of Chemical and Physical Sciences (CAPS). This year Flinders University’s Faculty of Science and Engineering will receive funding via the Asia Bound Mobility scheme to send up to five Flinders Nanotechnology students to UKM for a semester programme in 2015. Ian Sebastian, Country manager of Flinders University International Centre said CAPS had welcomed five undergraduate students from UKM to Flinders on a one year mobility programme funded by the Malaysian Ministry of Education. Such linkages had been further enhanced through the summer workshop programme delivered at UKM by CAPS leaders to be held for the third time this June. He said staff from both UKM and Flinders have also undertaken reciprocal short term visits focusing on research, workshops and laboratory work in areas including Speech Pathology. Prof Comar and Sebastian also met with UKM Vice-Chancellor Prof Dato’ Dr Noor Azlan Ghazali and Deputy Vice-Chancellor (Academic and International Affairs) Prof Ir Dr Riza Atiq Abdullah OK Rahmat after the discussions with Prof Imran Ho.